Registration is now open for staff and the public for the January 2016 Classes. 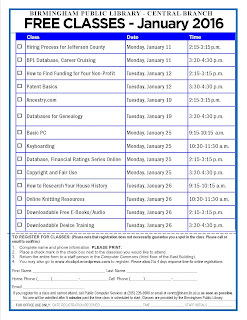 During this month, we include our popular computer classes, as well as genealogy, patent basics, and employment assistance classes. All classes are held in the Regional Library Computer Center (RLCC) of the Central (downtown) Library. PRE-REGISTRATION IS REQUIRED FOR ALL CLASSES. To register for any class, please email us at cenrtc@bham.lib.al.us or call 205-226-3681. 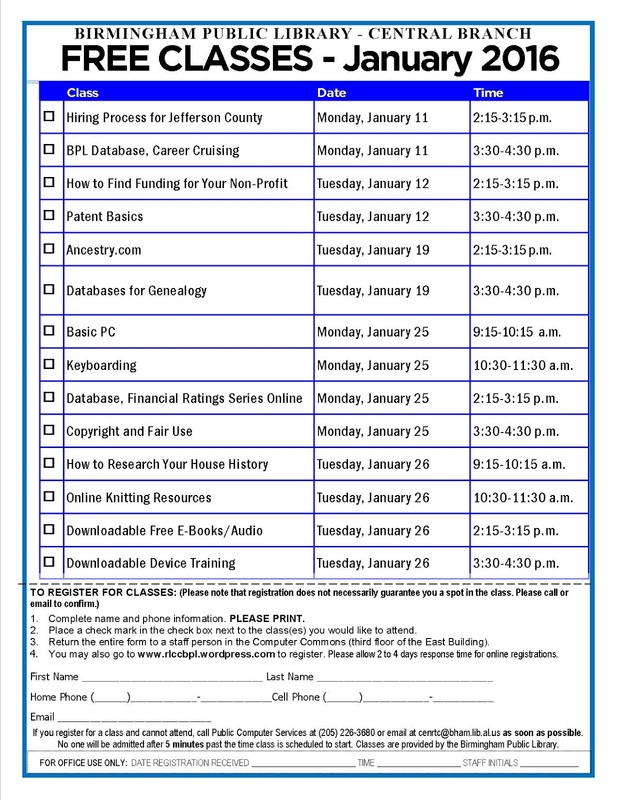 You may also download and print a PDF copy January 2016 Classes to bring to a Computer Commons staff member on your next library visit. Please note that the January 2016 Class Schedule pdf can be sent to us as an email attachment. Serving others is a privilege, especially when serving people who are less fortunate than we are. In most cases, service is equally if not more beneficial to both the recipient and server. In fact, several studies have linked higher self-esteem, happiness, and overall physical health to serving and helping others in need. Working for public libraries enables us to exercise this privilege and connect people to information and resources that will improve the quality of their lives. Subsequently, many of those people will do the same for someone else thus continuing the cycle of service. If you would like more information on how to serve, where to get started, or great examples check out the following books. Let’s approach the New Year with a heart of gratefulness and service and change the world one life at a time. Such a melodramatic title. It sounds like pulp tale from the golden age of science fiction. I can’t help but picture a stiff-legged, iron behemoth lumbering toward a helpless, screaming blonde. But Martin Ford hasn’t written a science fiction novel. In fact, he hasn’t even written a novel. 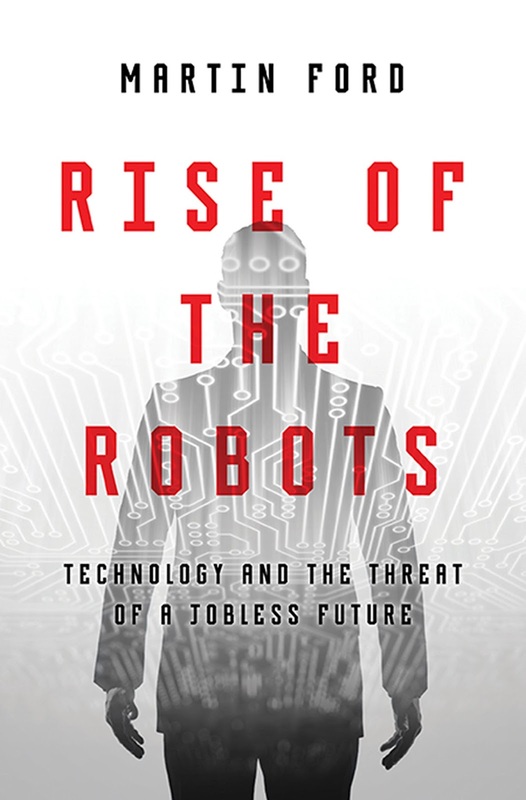 Rise of the Robots is an economic analysis of the increased use of robotics, automation, and algorithms in the workplace. Still, the conclusions he draws are just as frightening as watching The Day the Earth Stood Still, and one walks away from the book wondering if humans are already being harmed by robots. Job obsolescence from scientific progress is, of course, nothing new. I can only imagine how the invention and mass production of the automobile rippled through the early 20th century American economy. Saddle makers and farriers may have been the first to feel the effects, but they were not the last. I’m sure that at the time a majority of workers felt that any jobs, and concomitant skills, swept into the dustbin of economic history, were well worth the advantages gained in time and convenience provided by the new iron horse. After all, wouldn’t you prefer driving a train to shoeing a temperamental flesh-and-blood horse? According to another study, “about 22 million factory jobs disappeared worldwide between 1995 and 2002. Over the same seven-year period, manufacturing output increased 30 percent.” So the number of jobs for humans, at least in the manufacturing environment, is grim. However, from the corporate perspective robotics and computers are making factories far more efficient. At this point one usually hears the argument that progress in the job arena is usually considered a positive. Manufacturing jobs, after all, are frequently dangerous and offer fewer opportunities for advancement, or movement to another job sector. The American worker dreams that the next generation, his children, will have a better, more prosperous life via a professional job, e.g., accountant, lawyer, or technician. 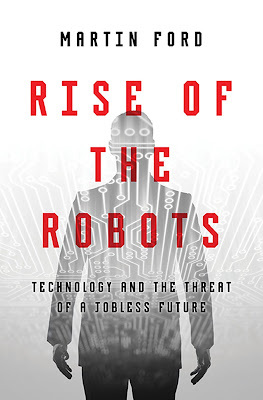 Unlike earlier waves of scientific progress, the triumvirate of robotics, primitive AI, and highly sophisticated algorithms are displacing workers in both traditional white and blue collar tasks: “Employment for many skilled professionals-including lawyers, journalists, scientists, and pharmacists—is already being significantly eroded by advancing information technology.” Martin’s book is full of examples proving that sectors traditionally safe from scientific progress are facing serious threats. He predicts, for example, that the number of news articles written algorithmically within 15 years will reach 90 percent. And at the moment, AI is already more efficient and successful at reading certain medical tests than humans. Worse, many CEOs now feel they have within their grasp the ideal workplace: a workplace with no, or very few, human employees. This brings us to the most disturbing trend. As Nike’s financial officer succinctly put it: “the long term solution is…to 'engineer the labor out of the product.”’ Such a workplace promises near perfect quality control, practically no labor issues, and greatly increased profits. Capital seems unable to see the obvious consequences of automatic and thoughtless acceptance of robotics, AI, and algorithms in the workplace: If workers are not working, how will they buy the running shoes? Perhaps for everyone’s sake we need to add an amendment to Asimov’s list concerning the right to work? Seven community libraries in the Birmingham Public Library (BPL) system will close for lunch beginning Monday, January 4, 2016. The libraries making this change are: East Lake, Eastwood, Pratt City, Smithfield, Southside, Titusville, and West End. Each of these seven community libraries will close each day that they are open to the public from 1:00 p.m. until 2:00 p.m. for lunch. 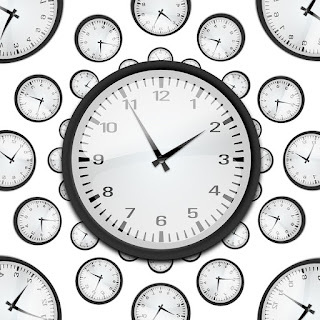 Their hours of operation will now be Monday through Saturday, 9:00 a.m. until 1:00 p.m., and 2:00 p.m. until 6:00 p.m.
BPL’s neighborhood libraries will maintain their current schedule with winter hours through Friday, February 26, 2016. The neighborhood libraries are: East Ensley, Ensley, Inglenook, North Avondale, Powderly, Woodlawn, and Wylam. During the winter hours, these locations are open to the public on Monday, Tuesday, Thursday, and Friday from 8:00 a.m. until 12:00 p.m., and 1:00 p.m. until 5:00 p.m., and on Wednesday from 1:00 p.m. until 5:00 p.m.
Library patrons will have access to the Central Library and the four regional libraries—Avondale, North Birmingham, Five Points West, and Springville Road—on Monday and Tuesday from 9:00 a.m. until 8:00 p.m., Wednesday through Saturday from 9:00 a.m. until 6:00 p.m., and on Sunday from 2:00 p.m. until 6:00 p.m. 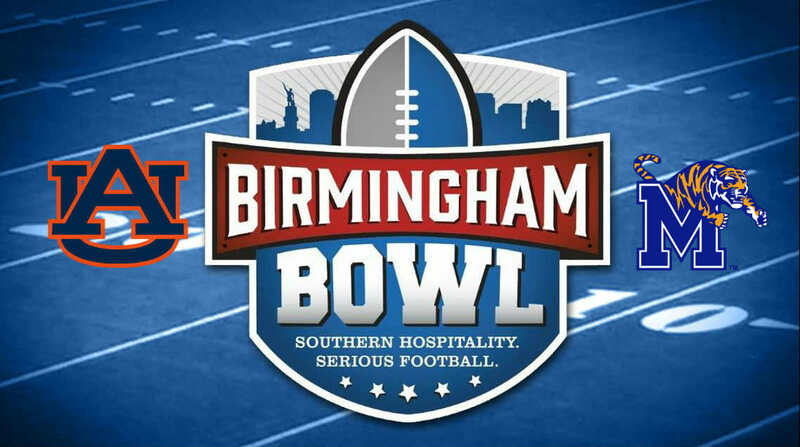 The Smithfield Library will be closed Wednesday, December 30, due to the anticipated large crowds expected for the Birmingham Bowl taking place at nearby Legion Field. The football game featuring the in-state Auburn Tigers vs. the Memphis Tigers kicks off at 11:00 a.m.
“When large events are held at Legion Field, our staff and library patrons usually have some degree of difficulty in getting to the Smithfield branch. With all of the excitement focused on the Birmingham Bowl, and especially with our own Auburn Tigers as one of the featured teams, our board agreed to close the facility for the big game,” stated library Director Angela Fisher Hall. All other 18 locations in the Birmingham Public Library (BPL) system will be open as normal on Wednesday. Smithfield Library will reopen during regular business hours on Thursday, December 31. All of the BPL’s 19 locations will close on Friday, January 1, 2016, in observance of New Year’s Day. 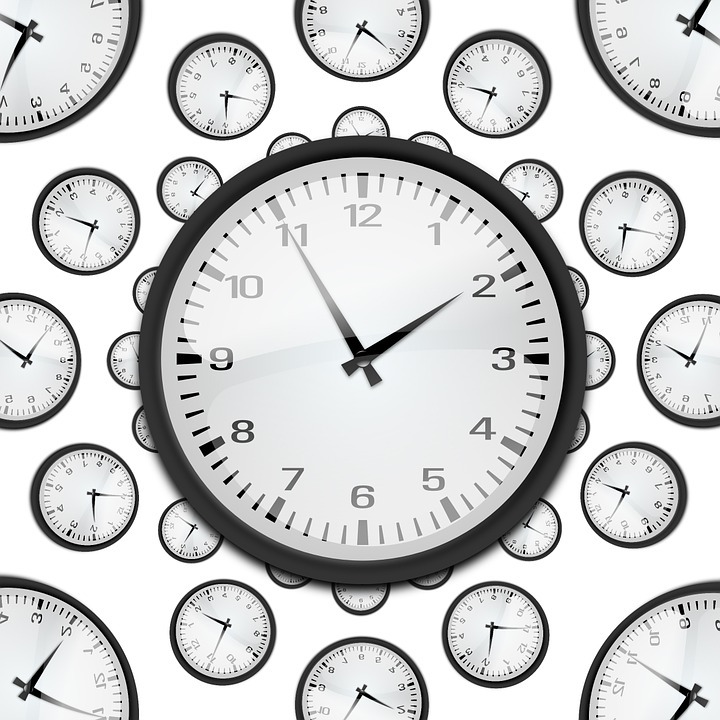 Libraries with weekend hours will open during their normal business hours on Saturday and Sunday, January 2-3, 2016. Recently, I read an AARP article online titled “A Year of Wise Money Moves." It encouraged me to think not only about financial housekeeping during the year, but things that will help me better organize my life. I want to set goals that can be accomplished, not make resolutions I know I may not keep. I am a bibliophile who is a librarian and there are so many books I want to read. This year, I’m going to make a list and try to read at least ten books on the list. If you want to try something like this, take a look at BPL’s Library Resource page to find recommended books for reading and best-seller lists. Remember, you can join our Best Sellers Club and read new books by popular authors. 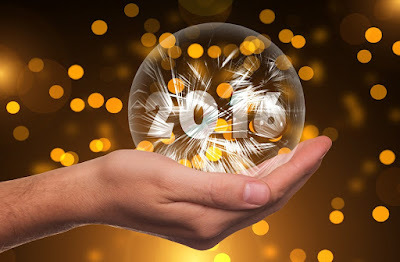 I don’t know about you, but the beginning of the New Year makes me think about sprucing up my home. I found a great website by Good Housekeeping that tells how to clean different surfaces. If you’re interested, take a look at the article“Do-It-All Cleaning Guide.” If you're also trying to lose weight and clean/organize your home, check out the book Lose the Clutter, Lose the Weight by Peter Walsh. And finally, learn to relax and have fun. A good way to do this is to find a hobby or start a collection. If this sounds like fun to you, take a look at these books on collections and hobbies. I hope this has given you some “goals” for the New Year. civil rights history with Oakwood School students. 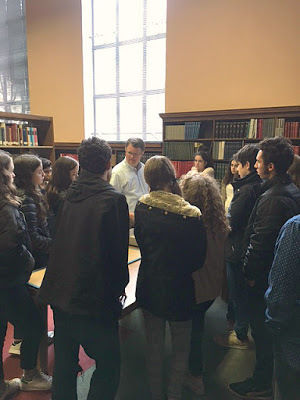 A group of students and teachers from California gained knowledge about Birmingham’s segregated educational past by visiting the Birmingham Public Library last weekend as part of a civil rights tour of Alabama. The 20 students and teachers from Oakwood School, a private K-12 school in North Hollywood, visited Birmingham, Montgomery, and Selma. While in Birmingham, they visited the Birmingham Civil Rights Institute and Central Library downtown. Here is background on Oakwood School: https://www.oakwoodschool.org/. At the Central Library, the students saw the 1963 jail docket that records the arrest of Rev. Martin Luther King Jr. and other civil rights demonstrators, bomb fragments from the 1962 bombing of Bethel Baptist Church, and an early copy of the "Letter from Birmingham Jail," said Jim Baggett, head of the Archives and Manuscripts Department in Central Library. Inspecting maps of segregated Birmingham school districts of the 1940s. Baggett talked to the Oakwood students and teachers about BPL’s civil rights documents, and took a photo of the group as they discussed maps that show Birmingham's segregated school districts from the 1940s. This is the second time students from Oakwood have visited BPL. Over the years, the Birmingham Public Library has hosted teacher groups from across the United States and teachers from around the U.S. and England. 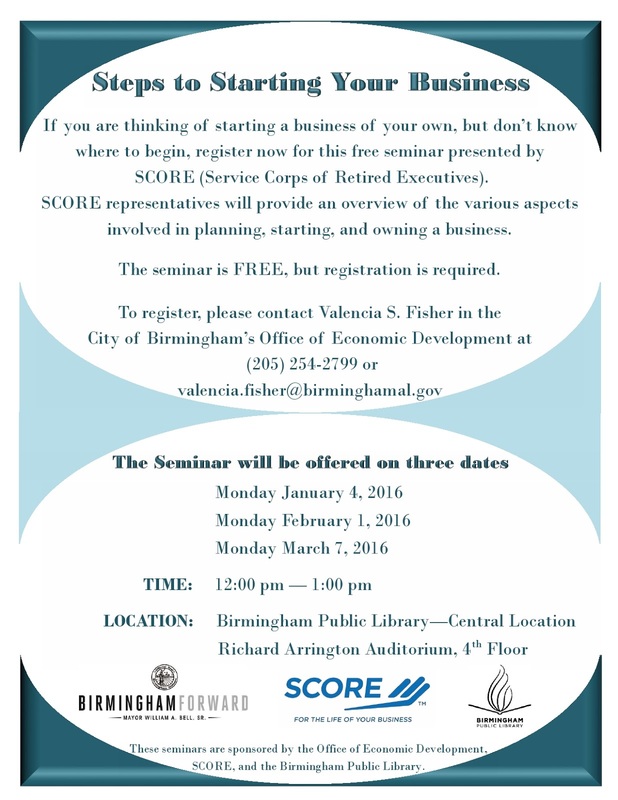 The Birmingham Public Library, in conjunction with the Service Corps of Retired Executives (SCORE) and the City of Birmingham’s Office of Economic Development, will be hosting a free seminar, Steps to Starting Your Business, on the first Monday of January, February, and March 2016 (January 4, February 1, and March 7). The seminars will be held from 12:00 to 1:00 p.m. on each day in the Arrington Auditorium, which is located on the 4th floor of the Linn-Henley Research Library. Each seminar will cover the same topics, but those who are interested are welcome to attend more than one day. Topics covered will include crafting a vision statement, identifying sources of funding, determining the legal structure of your business, devising a business plan, and investigating sources of business and economic information. 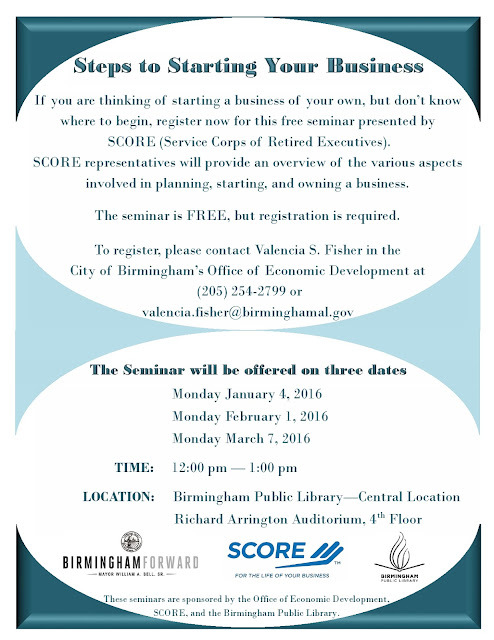 Please register for the seminars by contacting Valencia S. Fisher in the Economic Development Office at valencia.fisher@birminghamal.gov or by phoning (205) 254-2799. For further information about the seminars or about resources available at the Birmingham Public Library relating to small business development, please contact Jim Murray in the Central Library’s Business, Science and Technology Department at jmurray@bham.lib.al.us or by phoning (205) 226-3691. 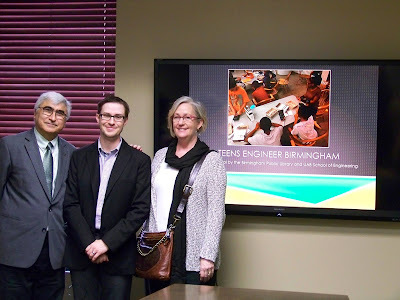 The BPL Teens Engineer Birmingham, a program of the Birmingham Public Library (BPL), has received a $50,000 grant from the UAB Benevolent Fund grant program. The money will be used to expand BPL’s afterschool robotics program for teens. Lance Simpson, system teen librarian for the Birmingham Public Library, said the grant will help expand the BPL’s teen engineering program, enabling it to serve more young people in Birmingham. Simpson and Carrie Campbell, grants and special projects librarian, submitted the grant application on behalf of BPL. 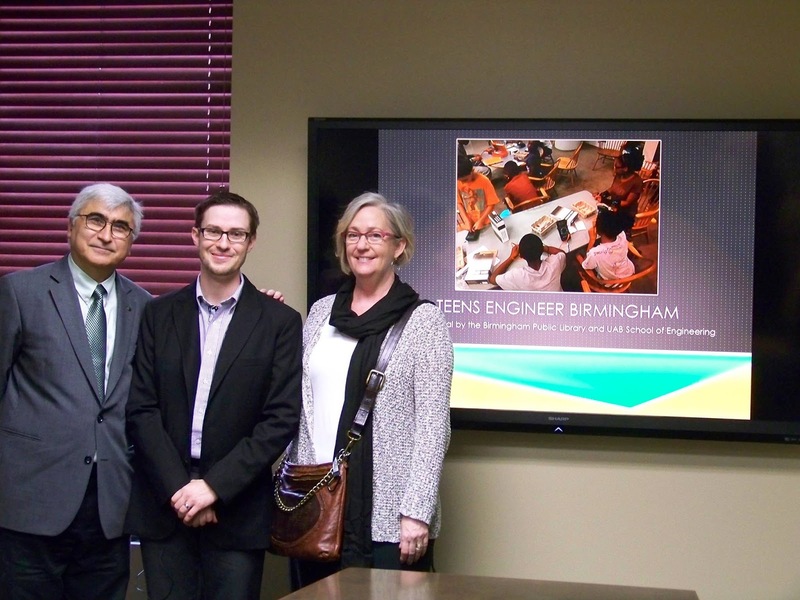 The UAB School of Engineering has been partnering with BPL’s Central Library in 2015, coordinating the afterschool engineering program offered for school children in Birmingham, including Phillips Academy downtown. Simpson said UAB’s School of Engineering is providing student mentors to work with the teens participating in the BPL engineering program. The $50,000 from the UAB Benevolent Fund will be used to provide afterschool robotics programs to students at the BPL’s Central, Southside, and Woodlawn Libraries during the 2016-17 school year, said Angela Fisher Hall, director of the Birmingham Public Library. “Congratulation to the team that worked on the program, including Teen System Librarian Lance Simpson,” Hall said. Lisa Higginbotham, UAB Benevolent Fund program manager, said in an email that tentative plans call for a ceremonial presentation in late February 2016 during a UAB Basketball game at Bartow Arena. “We appreciate the work BPL does in our community, and we look forward to a strong continued working relationship with BPL. 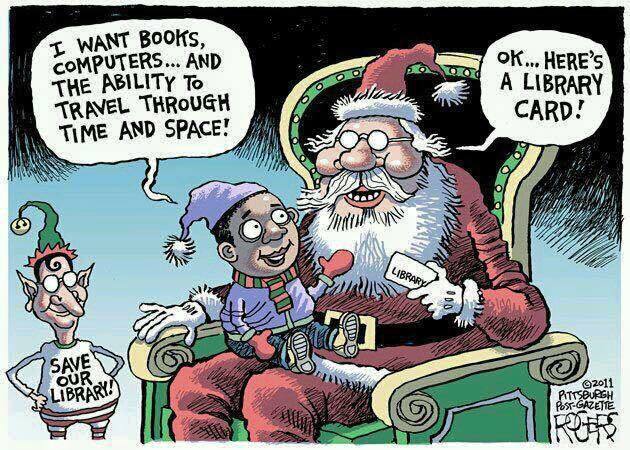 Happy Holidays and congratulations,” Higginbotham said in an e-mail to Simpson, the BPL teen librarian. 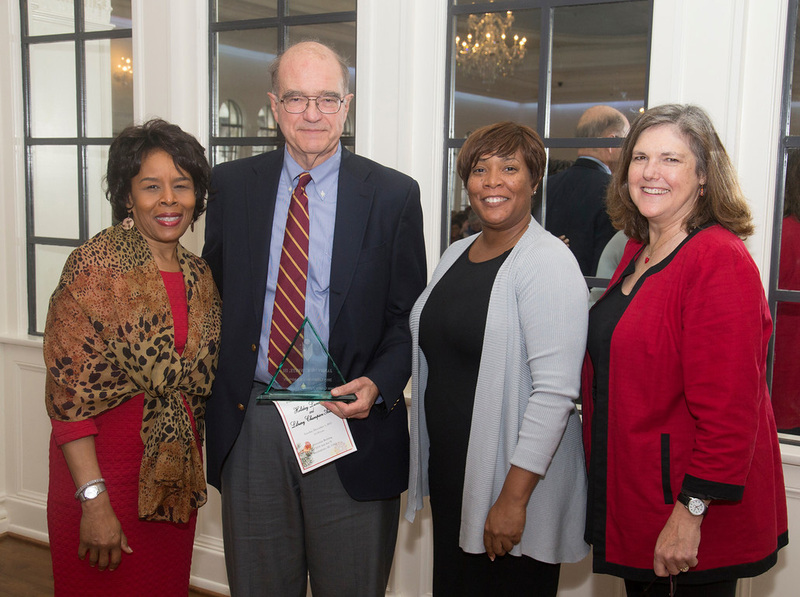 The Community Impact Grant enables UAB employees to make a real and measurable difference to a challenging community issue. 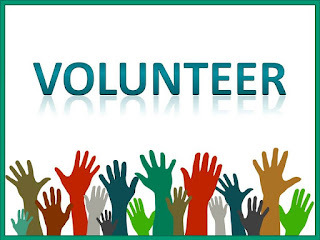 The grant is awarded to one nonprofit or a coalition of nonprofits submitting a proposal that results in a deep and direct impact in one of three areas: education, health, or economic security. Hispanic Interest Coalition of Alabama (HICA) and Red Mountain Park were the other two finalists competing with BPL. About 1,500 UAB employees cast their vote for the recipient agency after viewing video presentations from three finalists. 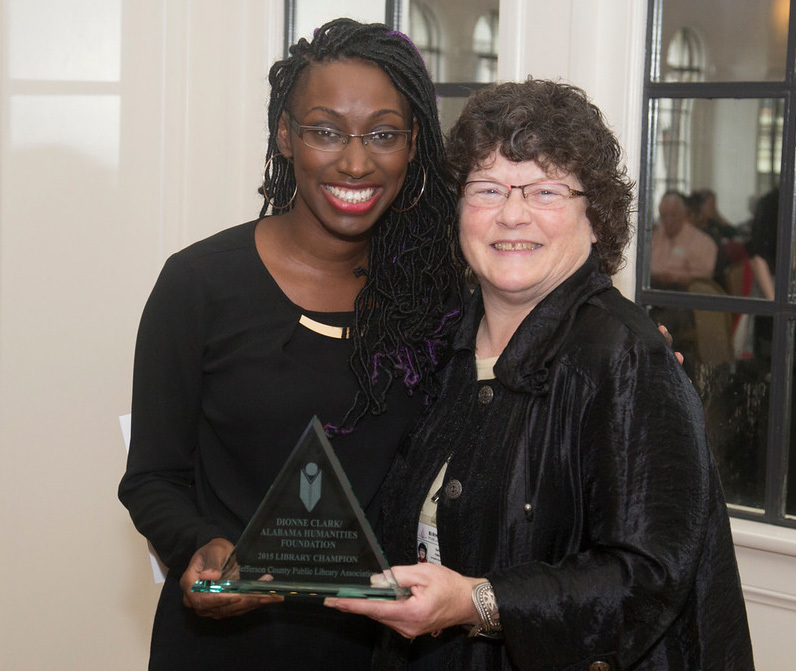 The first UAB Community Impact Grant was awarded to Magic City Harvest in December 2014. Central Library’s Arts, Literature and Sports Department has an amazing collection of music CDs, as you may know if you’ve been reading my ongoing series of blog articles. So here’s more from that bumpy, horn-shaped font of all musical knowledge. 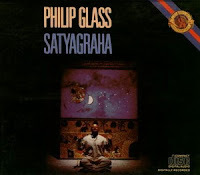 A 3-CD long opera in Sanskrit based on the early life of Mohandas Gandhi featuring characters that influenced and whom Gandhi influenced, namely MLK. The words are derived from the Hindu religious text the Bhagavad Gita. Sounds like an unlikely opera, right? I thought so, too, when I first heard about it. How was I to know that I would find it as accessible as most any opera music I’d ever heard? Like my norm, I don’t usually follow the libretto (which oddly enough sounds vaguely Italian), preferring to let the music-flowing, meditative, rapturous, full of lovely droning—put me in emotional states associated with those adjectives. Who could have guessed that a story about holding onto truth and passive resistance could be so dramatic and sensuous? There’s no opera singer I like more than Maria Callas. Part of what makes her special is that she sung opera as if it was theatre, bringing that element to the forefront where it often hadn’t been before her. This theatricality gave her singing a sense of urgency that I really enjoy. This collection of opera excerpts is my favorite Callas record and the best into to her I know of. Joy, tragedy, despair, defeat, and defiance are all here and much more on the emotional palette. The women she plays have definitely been through the shockwaves of human life. Not only an excellent Callas intro, but an excellent opera intro as well. This survey, released toward the end of the USSR, contains multitudes. It’s poignant that such a dreary place couldn’t fully suppress such a large array of spirited musical traditions. 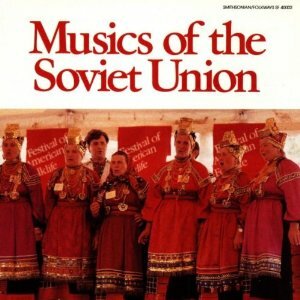 Lithuanian lullabies, Estonian bagpiping, Arab-inflected Mugam music from Azerbaijan, polyphonic Georgian singing (the musical equivalent to the stoutest beer you’ve ever tasted), Tuvan throat singing (where a singer can sound two tones simultaneously), just to name some. 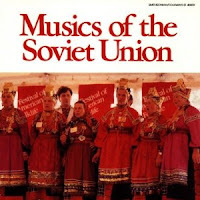 It’s a hearty and even dizzying mix and it shows that the old Soviet Union was more a continent than a country. The old Bear, despite holding up Russians as the ethnic group for everyone to aspire to, somehow still allowed some good things to go under the radar, one of which was ethnic music. 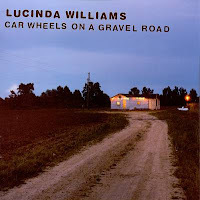 Lucinda Williams exhausted nearly everyone’s patience when she made this record, going through producers and musicians in a long, determined mission to get the sound and the songs just right. For once perfectionism didn’t kill off completion. It wasn’t her first (no one would’ve allowed a newcomer to fight a war like that) but it was her best, and remains so. It’s interesting the way the reviewers couldn’t come up with any consensus of what the music was, calling it blues, rock, country, folk. You can look at the categories on our catalog for a bit of that: folk, country, country-folk. There was, however, agreement as to how good it was. It was probably the most praised record of its year, genre not tripping it up after all. Forgetting genre, it’s plain vital popular music and a sort of ultimate Southern album. I could recommend it to anyone who likes their music rootsy. I also like that label-blurring hubcap/dobro/car wheel design on the disc itself. Are the holidays (or the news) stressing you out? Take a break at your local library. Your library can be an oasis of calm during your busy day, and can also provide a wealth of information if your brain is stymied for seasonal creativity. If you're truly Type A, browse our shelves for instructions for homemade gifts, decorations, and recipes, or shop the Friends bookstore at the Central Library. Less driven but still weary? Give yourself the gift of a few minutes just for you. Flip through a magazine, pick out some fun and relaxing fiction, take a puzzle break, or do some online browsing. Get that "shopping endorphin rush" by selecting and carrying as many items as you like to the "check out"; bag 'em up and take home armloads at no cost to you! Your library card is a guilty pleasure—without the guilt! Come check us out today! Merry Christmas and Seasons Greetings to all! If you grew up in Birmingham you may remember when Christmastime meant lights twinkling all over Linn Park—but it was Woodrow Wilson Park then, and the downtown area was a wonderland to any child for whom Christmas still seemed eons away, even in the middle of December. 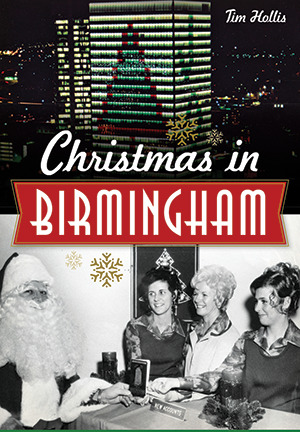 If you’d like to re-live those days, take a look at Tim Hollis’ new book, Christmas in Birmingham. You can take another walk through the Enchanted Forest at Pizitz, which played a part in the yearly battle for customers between Pizitz and Loveman’s. Join the crowds for Birmingham’s Christmas Parade and travel back in time to when Drennen meant a department store and not a car dealership—though a strangely prescient advertisement from around 1900 depicts Santa driving in an automobile instead of a sleigh. Or some of you may remember Eastwood Mall and St. Nick’s arrival by helicopter. The idea of waiting until December 3, much less the fifteenth, to begin one’s Christmas shopping may seem like it belongs not just in another century but on another planet considering that most stores today have decorations appearing in mid-September. It is just as surprising to learn . . . that stores did not close on Christmas Day; Loveman’s was open until 1:00 PM on the holiday, and nearby Drennen & Co. kept open from 8:00 AM until midnight on Christmas Day. Suddenly my own working hours look a good bit more generous. I couldn’t read this without a flashback to A Christmas Carol when Scrooge is aggravated with the idea of Bob Crachit taking off all of Christmas day for his holiday. However jam-packed with events and activities your holiday season may be, take some time off to enjoy Christmas in Birmingham. You may want to read it with your children (or grandchildren) to show them a different side of Birmingham, or you might have your older family members pass it around and see what they remember about how the city used to celebrate. However you choose to savor it, this book will give you some of the warmest feelings to be had this side of a cup of hot cocoa. Happy Holidays! 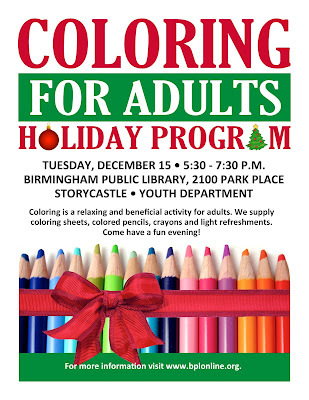 The Birmingham Public Library (BPL) is bringing back its popular Coloring for Adults workshop—this time an expanded edition to meet demand. The Coloring for Adults Holiday Program will take place Tuesday, December 15, from 5:30 to 7:30 p.m., in the Youth Department’s Story Castle at Central Library. The program offers a relaxing, beneficial activity for adults that proved popular during its debut in early November, drawing a bigger-than-expected crowd despite rainy weather, said Karyn Davis-West, public coordinator for the Birmingham Public Library. Free colored pencils, coloring sheets, crayons, and light refreshments will be provided. The program comes as industry leader Crayola has launched Crayola Color Escapes, a line of adult coloring kits featuring 11 by 17-inch black and white illustrations by artist Claudia Nice, plus a collection of colored pencils and colored markers. The Crayola line also features 8 by 10-inch coloring books for $10 featuring themed illustrations (Folk Art Escapes, Whimsical Escapes, Patterned Escapes, and Elegant Escapes). Here is a link to an article by Gizmodo that discusses how Crayola is positioning its adult coloring book line as a great, cheaper way for adults to relieve stress: http://toyland.gizmodo.com/crayola-now-has-its-own-line-of-coloring-books-for-adul-1741546239. For other holiday-related activities planned throughout BPL in December, visit http://bplolinenews.blogspot.com/2015/12/holiday-activities-planned-at-bpl.html. There is so much wonderful food in Japan! Ramen is yummy and popular here- it's much better than the instant ramen college students eat! Sushi is also yummy! 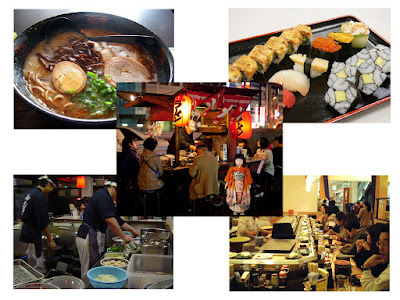 Sushi means sticky rice garnished with raw fish, vegetables, or eggs. There are even sushi bars with conveyor belts! 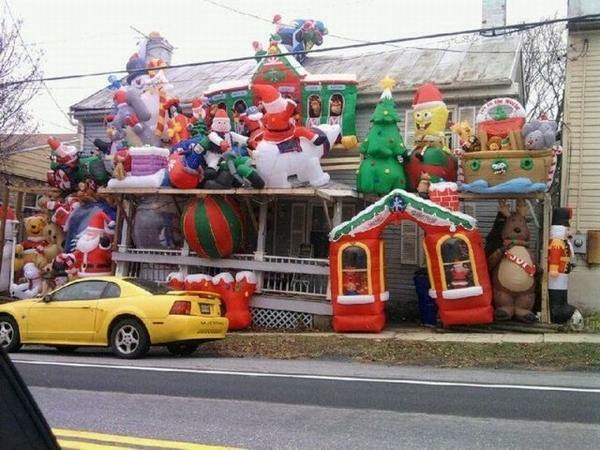 Holiday decorating is a big deal. There are TV shows about it, countless books about it, many stores that focus entirely on Christmas, and we pay to drive through holiday festivals of light. 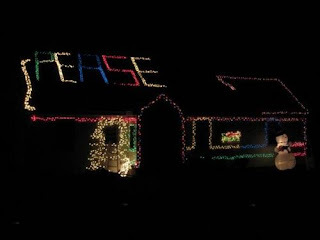 We are only a few weeks away from Christmas and since I don’t put up a lot of decorations, I thought I would give you, the reading public, some advice on holiday decorating. Tip 1. Take a minimalist approach – A friend of mine has adult children with their own families, so he doesn’t spend a lot of time decorating for Christmas. His decorations are a tabletop Santa and some Christmas lights he wraps around his artificial ficus tree. His traumatic experience trying to wrap garland around the columns of his house when his children were young may have influenced this new approach. 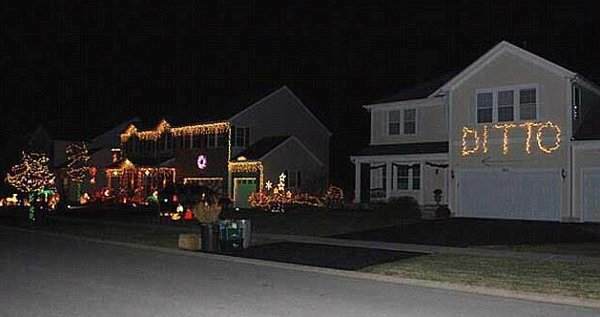 Don’t feel selfish if you are decorating in a simple fashion. All that matters is that you’re satisfied with it. 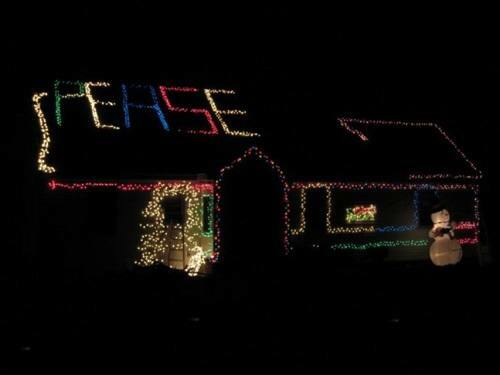 If friends and family want you to have more, tell them to come decorate. Tip. 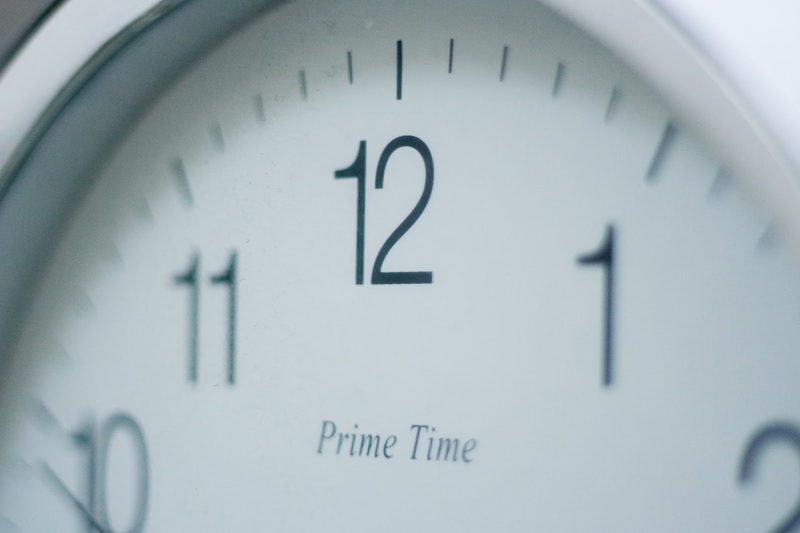 2 Don’t forget about dollar stores – Gordon Gekko had it wrong. Greed is not good, saving money is good. If I lost you, you are not up on your Michael Douglas movies. Having spent some time in Christmas outlet stores, I was amazed to see the array of Christmas decorations available at dollar stores. Seeing all the stockings, wreaths, figurines, and more at Dollar Tree made me think to myself that I could decorate up a storm for pennies on the dollar. Obviously, this won’t work for some people, but if you want a lot of STUFF and don’t want to spend a lot of MONEY, don’t overlook buying decorations at dollar stores. You can mix it in with your more expensive stuff. Tip 5. Get ideas from the library – As I mentioned above, there are countless books about decorating for the holidays. We have quite a collection of these books at the library. If you’re looking for ideas, inspiration, or instructions on making your own decorations, check out the collection of books at the library. I hope this blog entry made you smile and you have a happy and stress-free holiday season. In 1943, author and editor Philip Van Doren Stern completed a short story that had come to him in a dream. Unable to find a publisher but wanting to share it, he had it printed into booklets and mailed it out as a Christmas card to his friends. This little story, which he called "The Greatest Gift," eventually found its way to Frank Capra and became the basis for the classic film It's a Wonderful Life. Capra declared it was the story he had been waiting for all his life. It’s a Wonderful Life opened to mixed reviews and flopped at the box office, but was later nominated for five academy awards, including Best Picture. 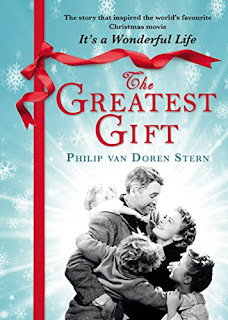 The film was largely forgotten until decades later when, although not originally considered a Christmas film, It’s a Wonderful Life became a television staple of the Christmas season in the late 1970s and gradually came to be regarded as a beloved Christmas classic. The American Film Institute recognized It’s a Wonderful Life as one of the 100 greatest American films ever made and ranked it the number one most inspirational American film of all time. Celebrate Christmas in Bedford Falls with us at the Avondale Library on Sunday, December 13, at 2:30 p.m., with an Adaptations screening party. The program is free and light refreshments are provided. 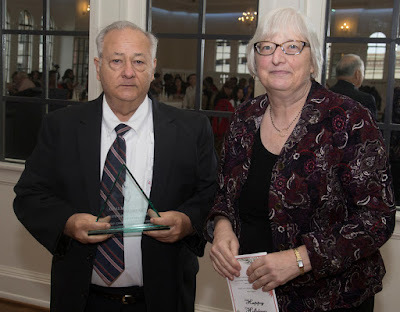 The Jefferson County Public Library Association (JCPLA) Library Champion Awards were presented at the JCPLA Holiday Luncheon on December 1, 2015. The Library Champion Award is presented annually by JCPLA. 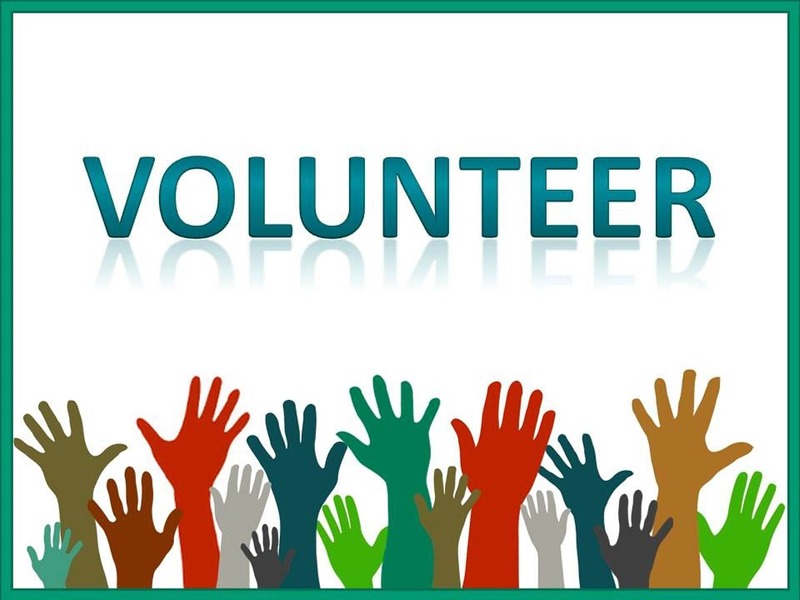 The award recognizes an individual or organization who has made a significant contribution(s) to libraries and/or librarianship in Jefferson County, Alabama. Three people who have supported the Birmingham Public Library (BPL) through the years were recognized as our 2015 Library Champions. Carmelo Alinano is a faithful member of the Wylam community who regularly attends Wylam Neighborhood Association meetings. He has championed the library for many years. A new library building is underway because of Aliano's diligent work in getting the city council, particularly the councilors from District 9, Roderick Royal and Marcus Lundy, to campaign for funding. Without Aliano's persistence, the new building would not yet be out to bid. The Wylam community will greatly benefit from a new building. The planned new facility will include a meeting room, staff break room, staff work room, a larger reading room, and a space for children. The Wylam community is looking forward to the energy that a new facility will bring. Dionne Clark sought out the Woodlawn Branch Library during the spring of 2013 to gauge their interest in participating in the Prime Time Family Reading Time program sponsored by the Alabama Humanities Foundation. The program was being re-established after a 21-year absence from the state. Woodlawn Library's family reading program is one of three pilot programs launched in the state to bring this vitally important resource back to families in under-served areas. Clark has been an integral part in making these programs successful by providing materials support and arranging staff training. Clark's passion for Prime Time Family Reading Time is evident in all the roles she plays in conjunction with the program. Jim White is a founding officer of the Birmingham Public Library Foundation Board. At the invitation of David Herring, acting president of the foundation, White joined the newly organized board and became president in 1998. Under his leadership, the foundation, working in unison with the library board, completed the design phase of a proposed renovation of the two buildings that make up the Central Library complex. As a follow-up to the completed designs, the foundation is in the midst of a feasibility study regarding the potential renovation. Additionally, the foundation has received numerous grants, gifts, and donations to supplement ongoing programs for BPL. In 2014, the foundation merged assets with the Friends of the Birmingham Public Library. And in 2015, the BPL Foundation Board made a distribution of funds for various programs equaling close to $30,000. The nest is empty. 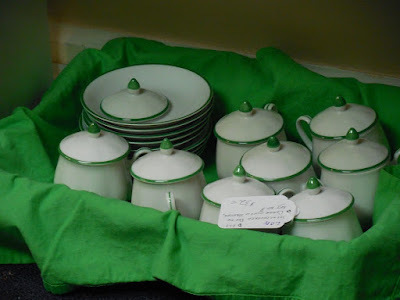 You know those silver-plated serving dishes that you received as wedding presents eons ago: the round platter, the tea tray, and the chafing dish? There is no point in keeping those pieces any longer. You don't use them and you’re moving from a 3,500-square-foot house to a 1,700-square-foot apartment. You must downsize! In this case, take the advice from Disney's Frozen; Let it go. Sell those unused items and get some cash. But before you start financing that favorite vacation from the profits, take off the rose-colored glasses. There's just not as much value in things as we think; not even if that silver platter has feet. In downsizing you need to shrug off any hurt feelings if your children don't want your items. They do not want grandma's china (it can't go in the dishwasher), and people are eating out more. In conclusion, downsizing can be frustrating, but just remember: Johnny is settled in his apartment, Angela is happily married, and so a simple solution is to keep the things you cherish or use, and simply get rid of everything else. Good luck with your downsizing! Elder Care Alliance. "The Upside of Downsizing"
HGTV. Real Estate Tips. "Should I Downsize My Home?" Money Crashers. "Why Downsizing Your Home Can Save You Money"
Lifehacker. "How to Downsize Your Home Without Losing Your Mind." "Eight Things You Can Discard to Downsize Your Life"
The Richmond Register. "The ins and outs of downsizing your home"
Fox Business. "A 3-Step Downsizing Plan for Seniors"
The Birmingham Public Library System’s seven neighborhood libraries will be closing early to the public on Wednesday, December 2, as part of their annual planning day for Youth Services. The BPL locations will reopen during regular business hours on Thursday, December 3.